Olfactory ensheathing cells (OECs) have been investigated extensively as a therapy to promote repair in the injured CNS, with variable efficacy in numerous studies over the previous decade. 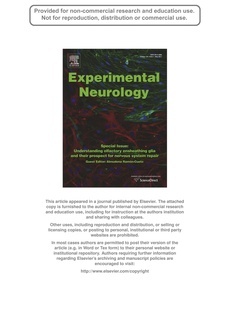 In many studies that report anatomical and functional recovery, the beneficial effects have been attributed to the ability of OECs to cross the PNS朇NS boundary, their production of growth factors, cell adhesionmolecules and extracellular matrix proteins that promote and guide axon growth, and their ability to remyelinate axons. In this brief review, we focus on the interaction between OECs and astrocytes in vivo and in vitro, in the context of how OECs may be overcoming the deleterious effects of the glial scar. Drawing froma selection of different experimentalmodels of spinal injury,we discuss the morphological alterations of the glial scar associated with OEC transplants, and the in vitro research that has begun to elucidate the interaction between OECs and the cell types that compose the glial scar. We also discuss recent research showing that OECs bear properties of immune cells and the consequent implication that theymay modulate neuroinflammation when transplanted into CNS injury sites. Future studies in unraveling the molecular interaction between OECs and other glial cells may help explain some of the variability in outcomes when OECs are used as transplants in CNS injury and more importantly, contribute to the optimization of OECs as a cell-based therapy for CNS injury. This article is part of a Special Issue entitled: Understanding olfactory ensheathing glia and their prospect for nervous system repair.